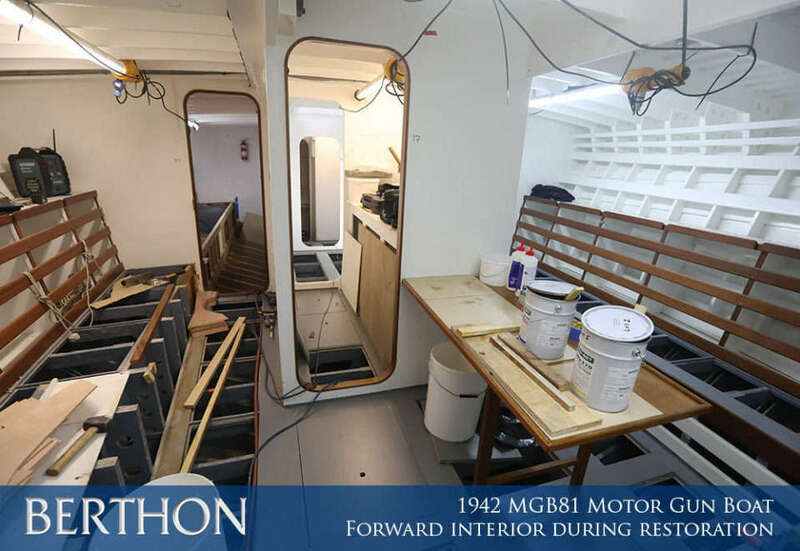 Following hot on the heels of last month’s eNews detailing the removal of the 3 835hp MAN engines and the restoration of the famous Motor Gun Boat 81 (MGB 81) we now take you below decks to see the replacement of structural frames and longitudinal stringers. 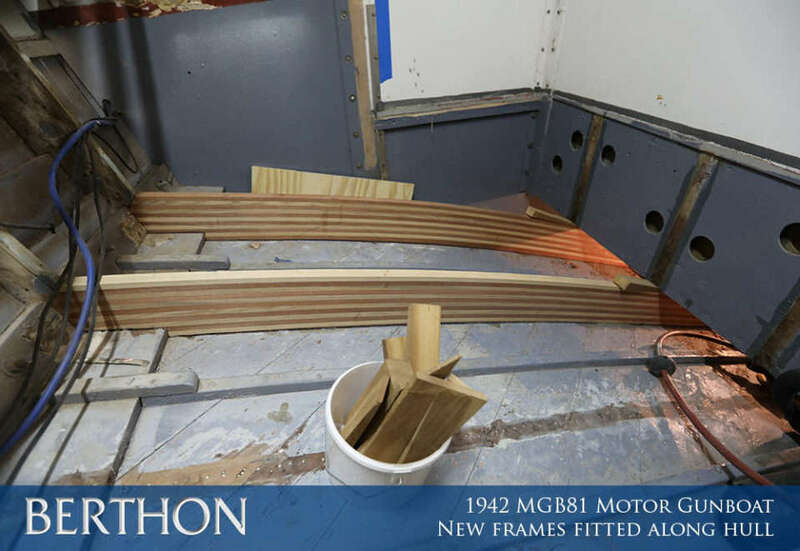 Before any of the work could begin all removable panels, ie bunk tops and floor panels, were dismantled and stored; this exposed the delamination of the frames. 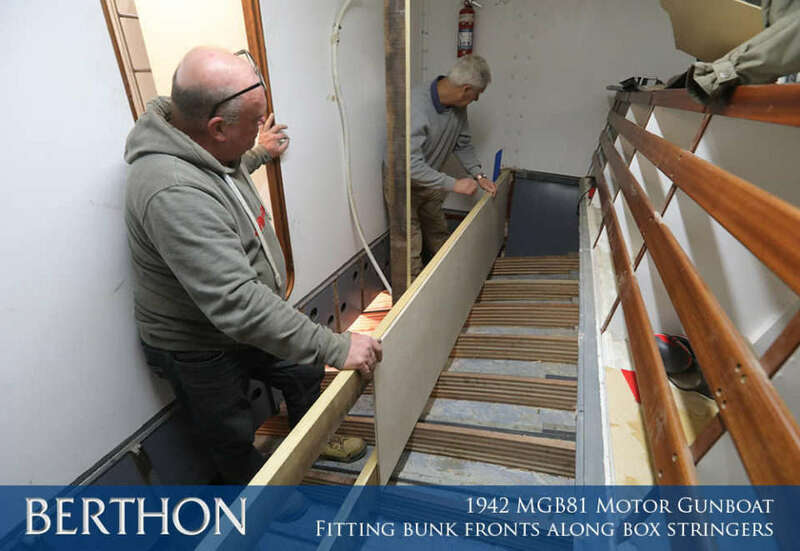 To gain access to these, the floor bearers and bunk supports had to be removed which included the outer longitudinal which was also the bunk front port and starboard. Cengar jigsaws were used to remove the affected frames and a reciprocating saw was then used to cut the frames into shorter sections to make removal easier; mauls and lump hammers were the tools of choice to detach remnants. Unfortunately, there is no delicate way to remove these original but sadly partly rotten structures as everything was glued in place along with hundreds of ring nails and screws. 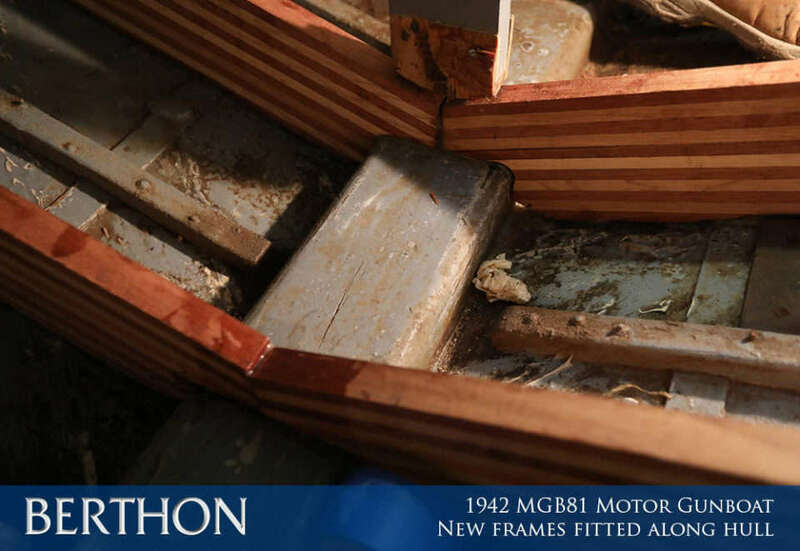 With the frames removed there were still sections of plywood biscuits still attached to the topside frames, so these were carefully chiselled off in order to protect the 76-year-old mahogany diag hull planking. 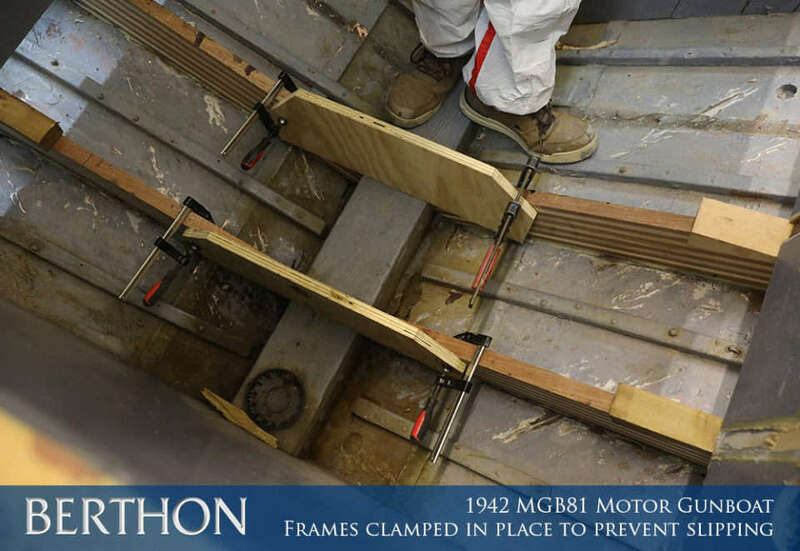 The screws and nails were subsequently cut off and ground flat before the hull was sanded and cleaned for the new frames to be added. Each new frame is made up of 12 planks, made from a flexible, light ash and a heavier stronger utile (hardwood), these are glued together to make a strong and flexible frame. Every pair of frames is a different shape, as the curve of the MGB hull becomes more pronounced as it gets closer to the front. This meant that every time a new set of frames is laminated the jig has to be adjusted, even if it is only by a few millimetres. After the main shape has been formed a template is set up along the original beams’ position, and a more accurate shape is taken. This is done with a spiling block. Spiling can be an art form in itself. 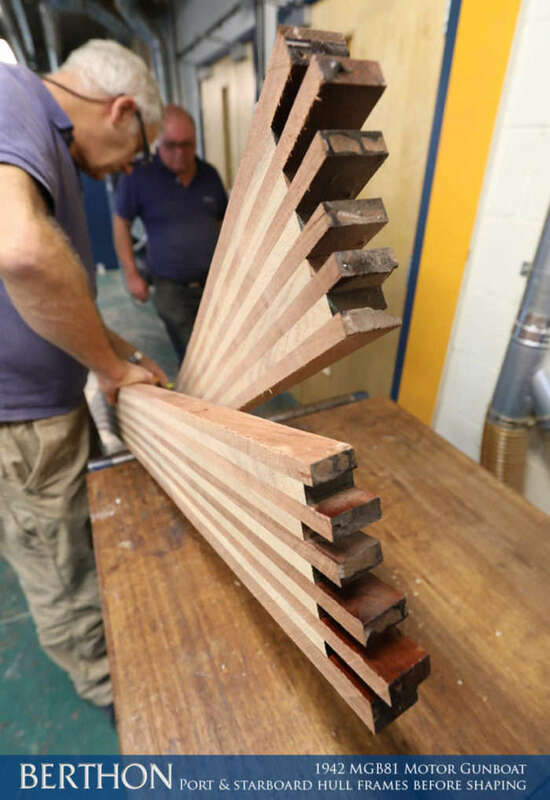 It is generally used in carpentry and shipbuilding, when the dimension is taken from a straight line, a mould’s edge or rule staff, to any given side or curve of a plank’s edge. This is then placed in the jig and clamped in place to create the correct curve. Once it has had time to fully dry it is cut into two halves to form 2 individual and identical frames, one port and one starboard. 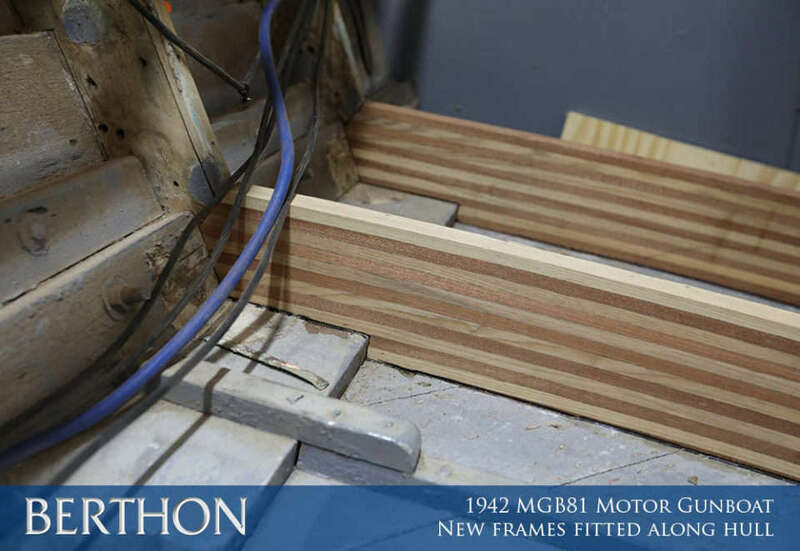 This process is repeated 24 times to create the 48 new frames. 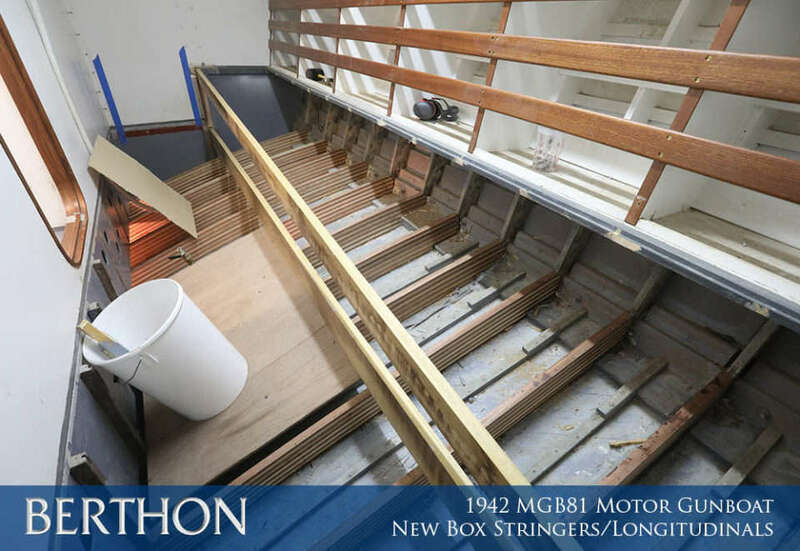 This is a perfect teaching opportunity for our apprentices since spiling and making up laminated frames for old wooden craft is not an every-day ask in a modern boatyard; however, for those of you following the RIPPLE (1925 35’ Berthon built boat) restoration a similar task was undertaken. Mostly the odd frame in a wooden yacht is sistered as a quicker and cheaper option albeit doubling up means more weight. The template is lifted off and laid out on the new timber to be cut, the marks are then transferred in reverse using the same spiling block. A continuous line using a fairing batten then joins these points. When it comes to replacing an old plank or panel the most obvious way is to copy it by simply tracing around the old one. However, getting an old plank out without it breaking or distorting is much easier said than done. Especially one that is water damaged and rotten. 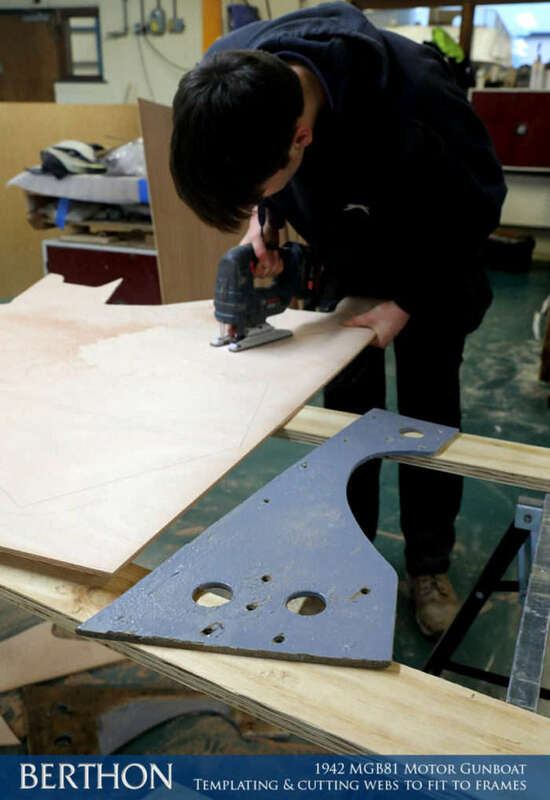 The new frame is then cut to shape and fitted into place in the original position. To get the perfect fit, as spiling is accurate but not perfect, the frame is finally planed in position until it is a seamless fit. 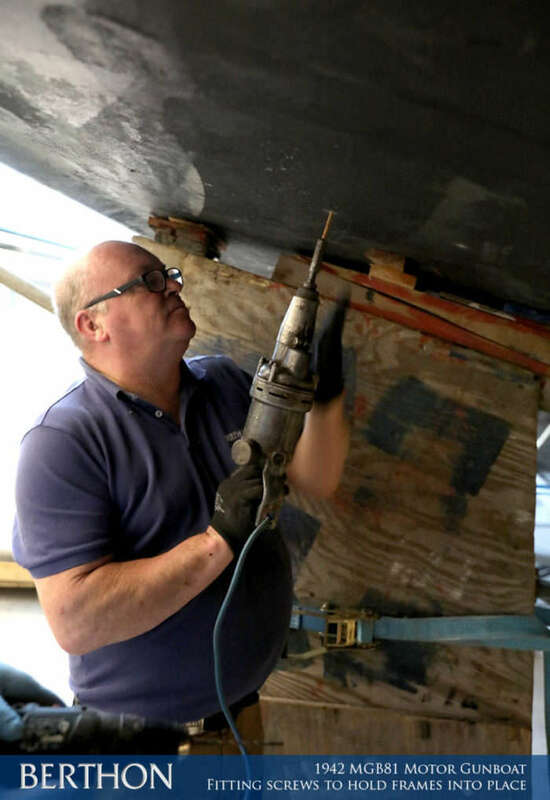 When the team are happy with the position and fit of the frames, pilot holes are drilled through the hull every 8 inches following the line of the frame. The beams are then dry fitted in place before being glued, clamped and wedged, with wooden pegs to prevent any slipping. From the outside and using the previously drilled pilot holes for guides the frames are permanently screwed in place. The screwdriver machine used to fit the 3.5-inch silicon bronze screws is somewhat special. 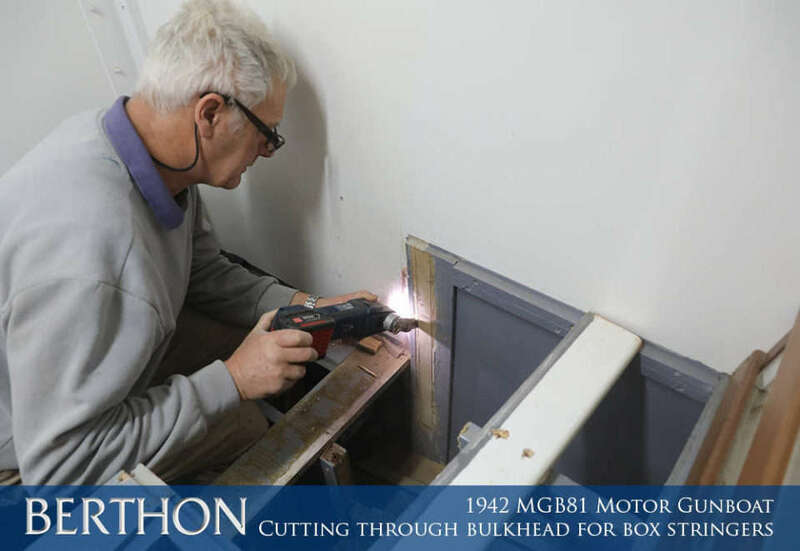 It was owned by the grandfather of Steve Phillips, a senior Berthon shipwright who worked for British Powerboats in 1940, giving it an incredibly strong chance that this screwdriver machine was used in the original build of MGB 81 back in 1942. The main reason for resorting back to this equipment is because of how powerful it is. 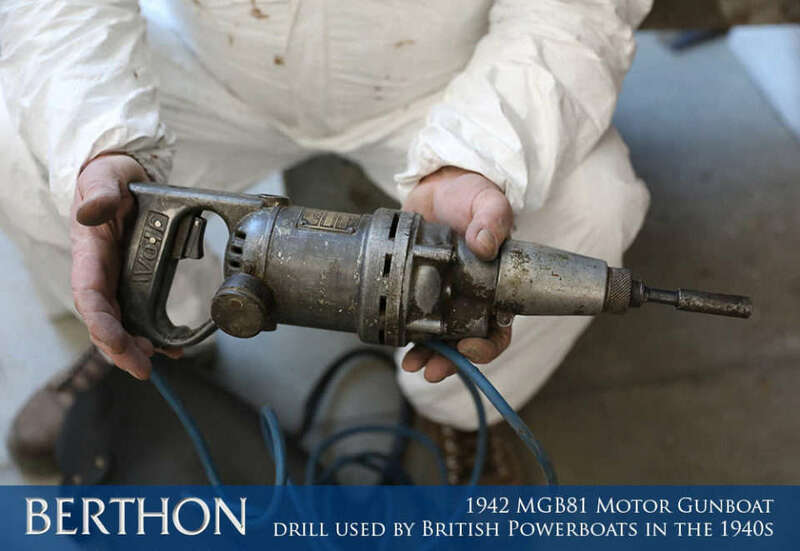 The drill has to have enough power and torque to drive a screw 3.5 inches long through the 1-inch thick mahogany hull three diag under water and double diag above the waterline, followed by 2.5 inches of the ash and utile beams. For any equipment, this would be tough to drive each screw through. Even though there may be modern tools powerful enough for the job, using the traditional tools and teaching the apprentices with these methods is always preferred. The existing stringers/longitudinals were originally butted up against bulkheads and were only glued and screwed through and fitted in place. We have now cut through the bulkhead and fitted each stringer together in the middle, with a simple scarf join, to make 4 longer 23’ foot stringers rather than 8 x 11’6” foot box stringers. The ends are also now set into the bulkheads and fitted in place. All of these changes will make her more structurally sound and far more rigid, hopefully negating the need for another refit soon. Quite clearly once a frame or two started to delaminate owing to excessive stress, others nearby then took the toll and the more movement there was the more frames became dislodged allowing moisture to wend its way into rot. This was a more difficult job than originally planned. 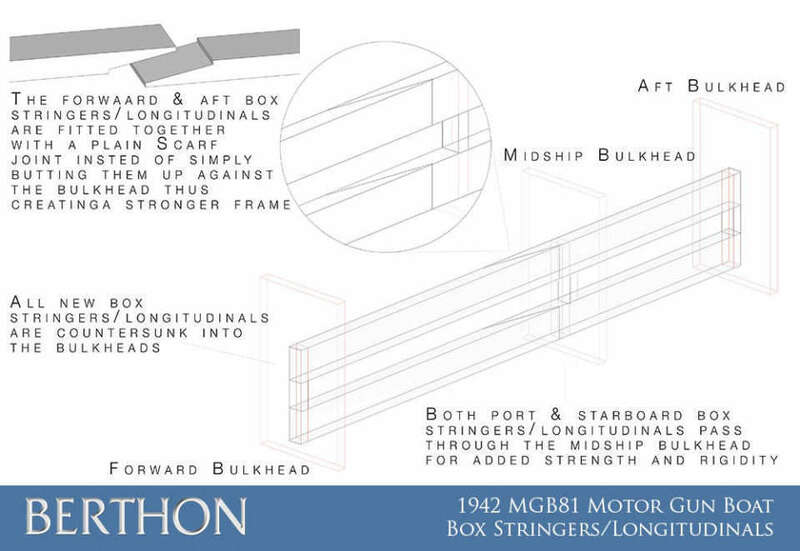 Four 14’6” foot beams were passed down through the forward hatch and along onto the starboard side, but, as expected the pivot point was too tight for the port side pair which were returned on deck to eventually pass freely through a hole cut by us in both the forward mid-ship bulkheads to fit into the port cabin. A shipwright’s job is never easy! 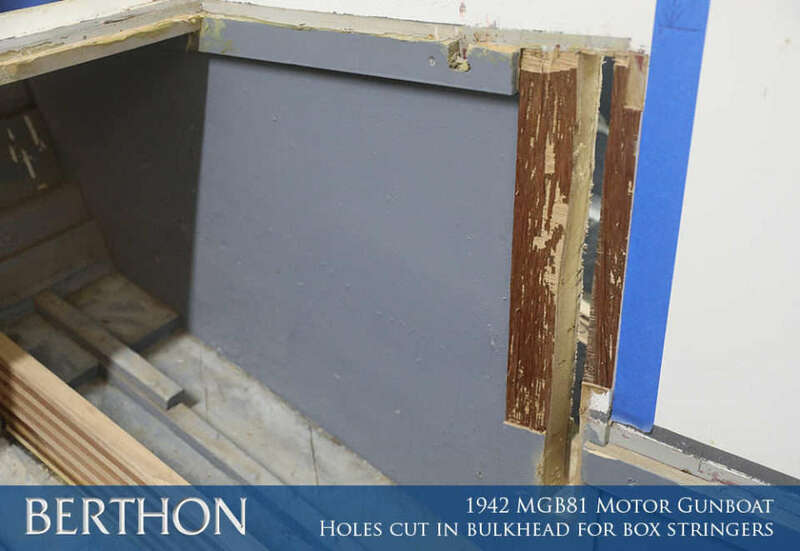 The challenge here was to again get the materials through the forward hatch and into each room. 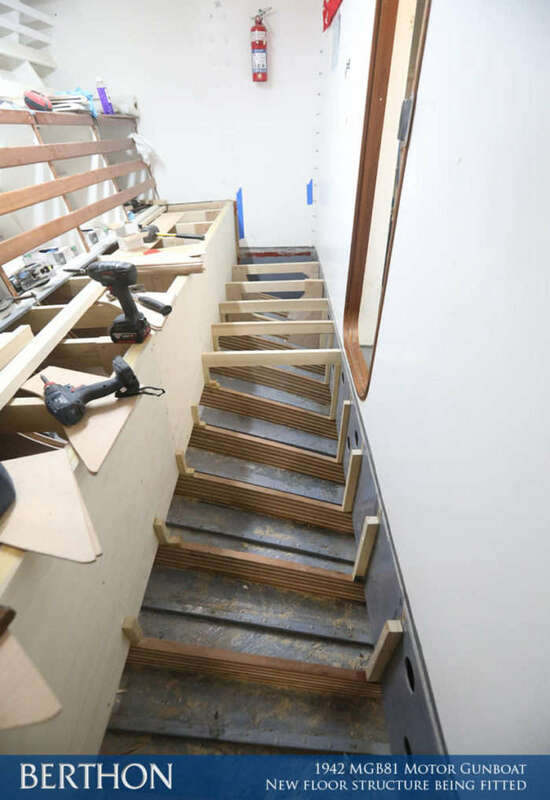 These were glued onto the backs of the main bench frame frames, wedged from below with wooden pegs, in keeping with the way she has been finished throughout the entire boat, and finally screwed into place. The top was planed off for a smooth finish, ready for the bench tops to be added. 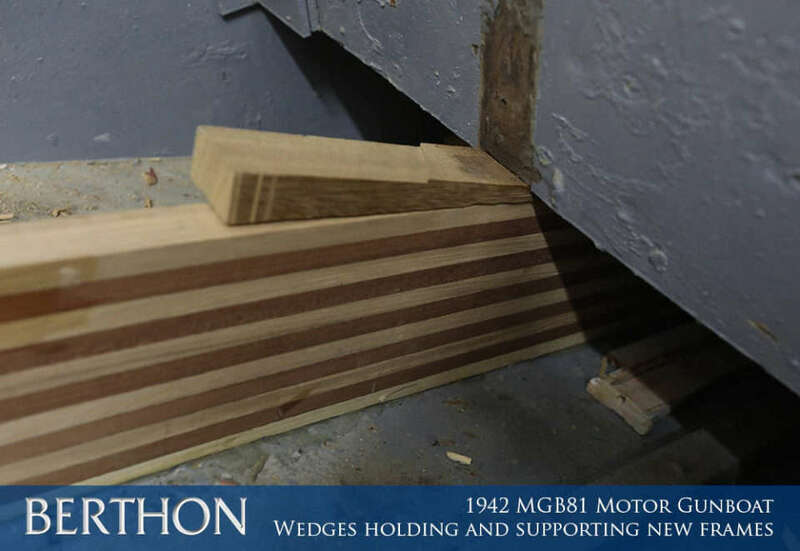 Later, wooden uprights will be fitted to add to the strength and prevent any chance of the frame dropping or warping in damp conditions, adding to the structural integrity of the support. 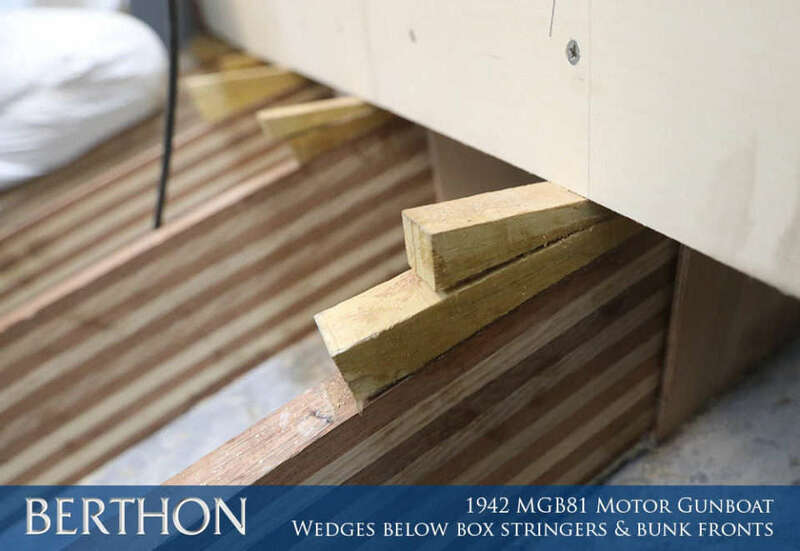 The use of the plywood webs or stiffeners is to lock everything together; every corner or connection between two frames is reinforced with a web which has been glued and screwed into each frame. 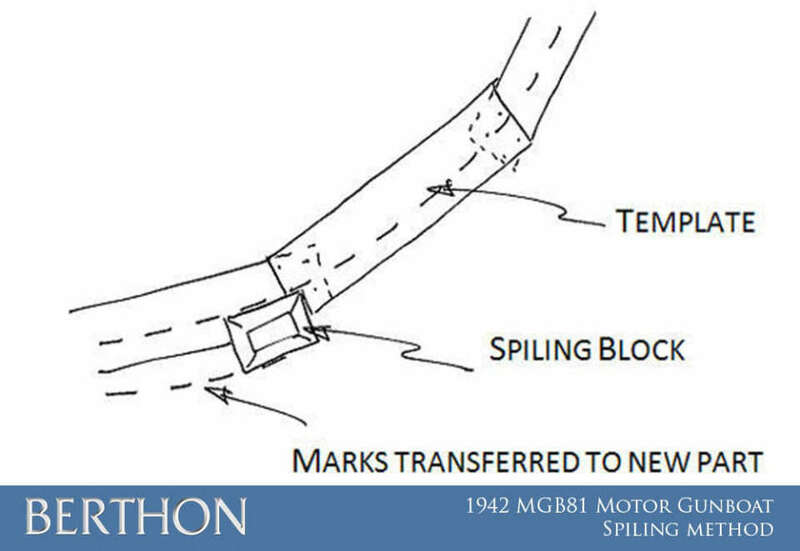 This pulls one to another and prevents any slipping along with stiffening up the entire structure and preventing anything from breaking or moving when she is up to speed and slamming in any swell. Don’t forget these boats were capable of around 40 knots (yes, in 1940!). When removing the original interior, a selection of each different web was carefully removed and saved in order to keep the pattern. These were replicated 300 times to create a new set, ready to be installed. 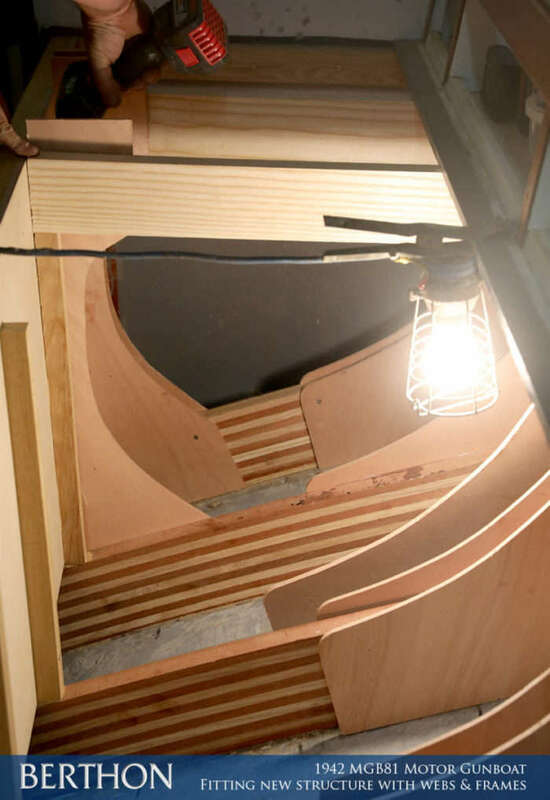 As with the frames, the webs were dry fitted and planed on site to create a perfect fit, as no 2 sets were the same – again due to the change in the hull’s angles. The floor assembly was replaced in the same style with the structure and webs tying it all together. 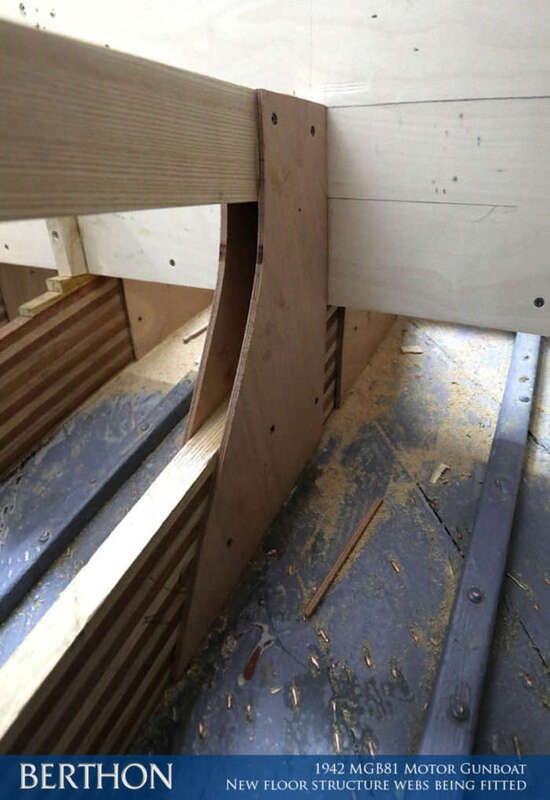 Rather than cutting the uprights for the main floor supports to sit flush with the angle on the hull beam below we have kept to the traditional methods. 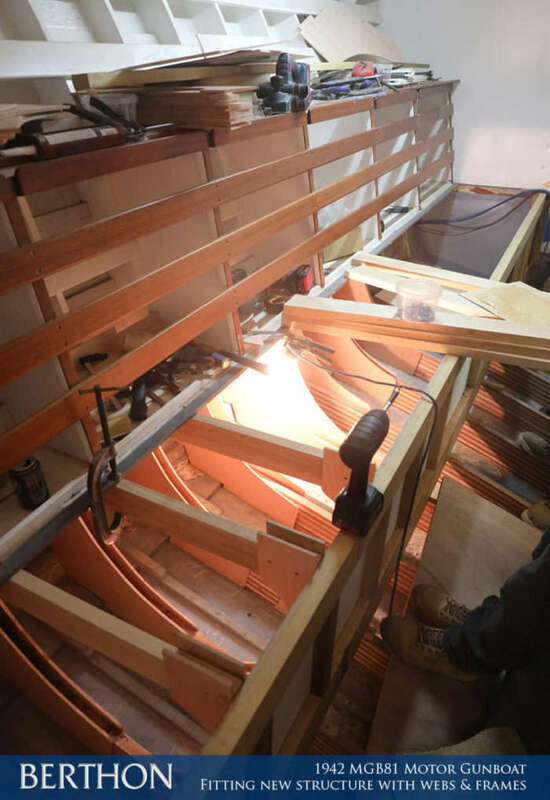 The wedges are glued into place and screwed down into the beam, the upright is then glued down and screwed through the bunk front into the structure behind. 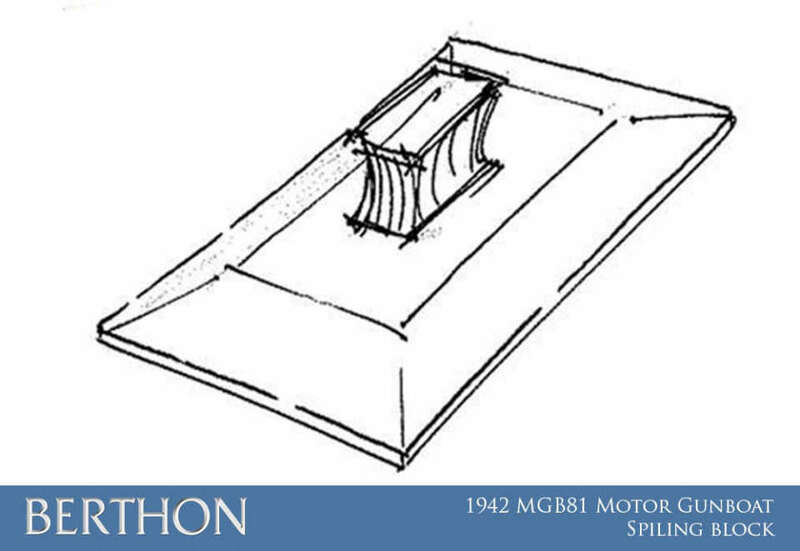 This will create a stronger support, rather than it sitting at a harsh 45° angle, it will all be square at 90°. There are still a few jobs outstanding, including painting the new frames (which seems a pity because the laminates look more appealing in raw form!) and structure in the original blue/grey. We will then replace the original removable panels for the floorboards and bench tops. These will be some of the last jobs on the list to avoid any damage. 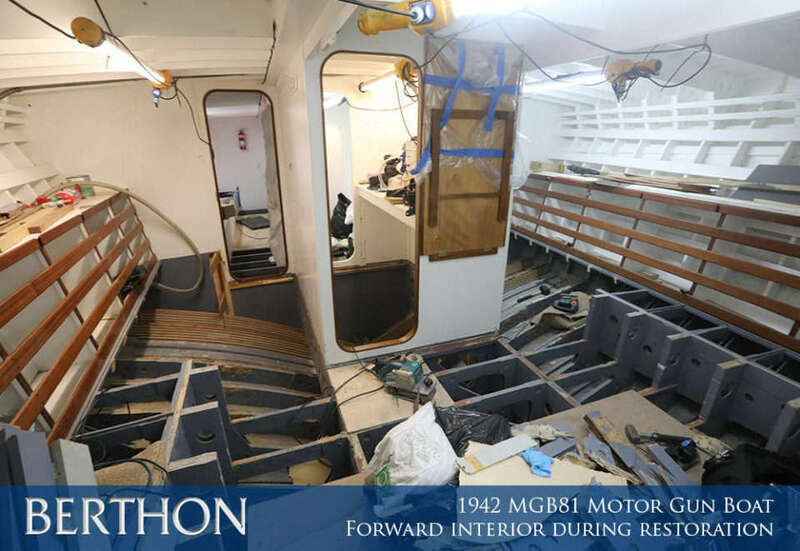 The entire forward Cabin has been stripped out in the same way, apart from this time only 3 frames and the attached structure were removed at a time. This meant there was still space to move around and work without permanently working on an incline. It also prevents the hull shape from possible distortion. 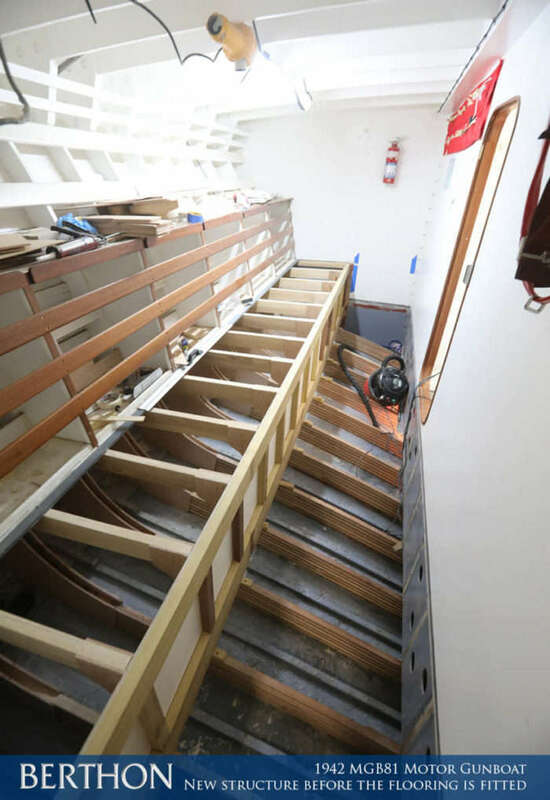 Temporary floors have been added for safety as the drop from the top of the floor beams to the bottom of the hull is over a meter. 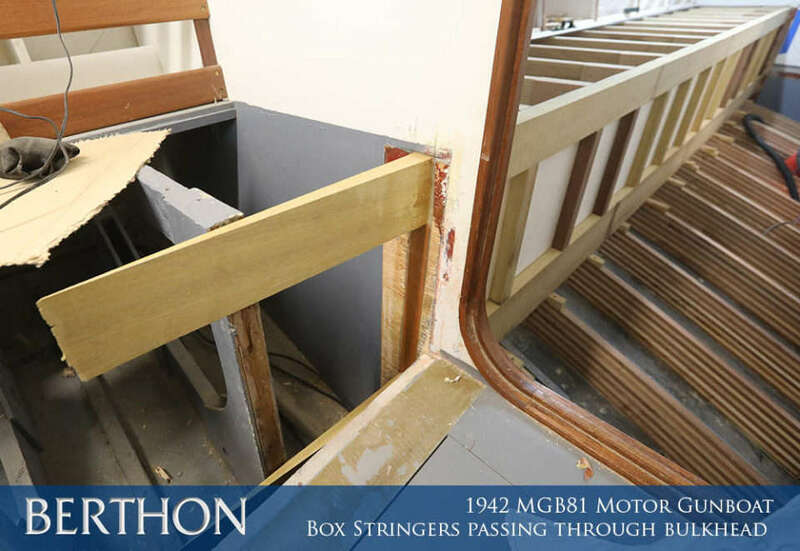 It is not only a safety concern but also the amount of material that is being removed from MGB81, the last thing that we want is for it to be dropped between the deck frames and have to retrieve it later on. All of the remaining hull frames have now been replaced, including a few extras, which have turned out to be more damaged than previously believed. All that remains now is to rebuild and replace the main structure, patch the holes which were cut to create an access for the main supports in the benches, repaint the structures and replace all flooring. Progress and updates on this project can be followed on our website here or register for our monthly eNews blog here.